This is the third of a three-part series (finally!) on the Prosperity Gospel, the belief that God wants people to be financially prosperous. You can find part one here and part two here. Two-thirds (66%) of American Christians answer affirmatively to at least one of the four Prosperity-related questions, although the average person (i.e. all independent variables set at their means) in the U.S. has about a 5% chance of identifying as a member of a Prosperity Movement, the most conservative estimate of Prosperity adherence. Those with the highest probability of agreeing with central Prosperity tenants tend to be older, less educated, and black. As you can see in the table below, blacks are exceptionally less likely to agree that poverty is a sign that God is unhappy as their education increases, to the point that highly educated blacks are virtually indistinguishable from their highly-educated counterparts of other races. 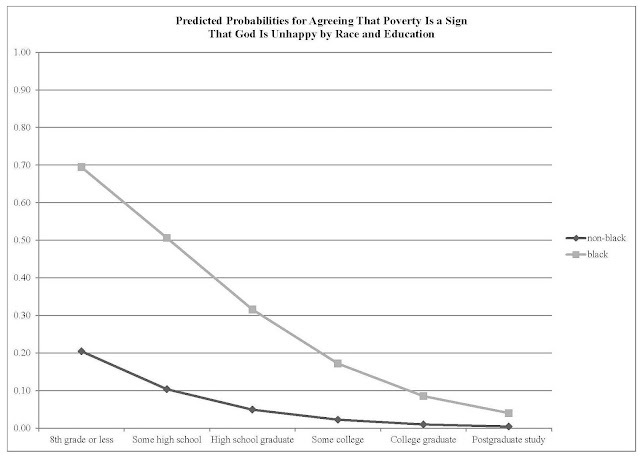 In other words, education has a greater effect in suppressing support for the Prosperity Gospel among blacks than it does among other racial groups. Surprisingly, one’s level of income has no bearing on Prosperity adherence. This has two important implications. First, the Prosperity Gospel does not live up to its claims of wealth. Second, even though the Prosperity folk are no more likely to be wealthy, they also aren't poor. This deserves further investigation. Overall, the Prosperity Gospel is a flexible and multivocal theology that is well suited to be adapted to varying social locations, particularly in a society like the United States that is radically individualistic. The Prosperity Gospel offers psychic comfort and rationalization to those from a number of different situations, backgrounds, and experiences. Virtually all religions offer otherworldly rewards for those lacking in this-worldly comfort. What makes the Prosperity Gospel unique among religions is its overt promise of temporal, material rewards. In the absence of "natural" opportunity, the Prosperity Gospel offers a supernatural means to material advancement.